Samuel Orchart Beeton (1831-1877), Publisher and journalist; husband of Mrs Isabella Beeton. Artist associated with 40 portraits, Sitter in 1 portrait. Jules David (1808-1892), French painter, illustrator and lithographer. Artist associated with 19 portraits. 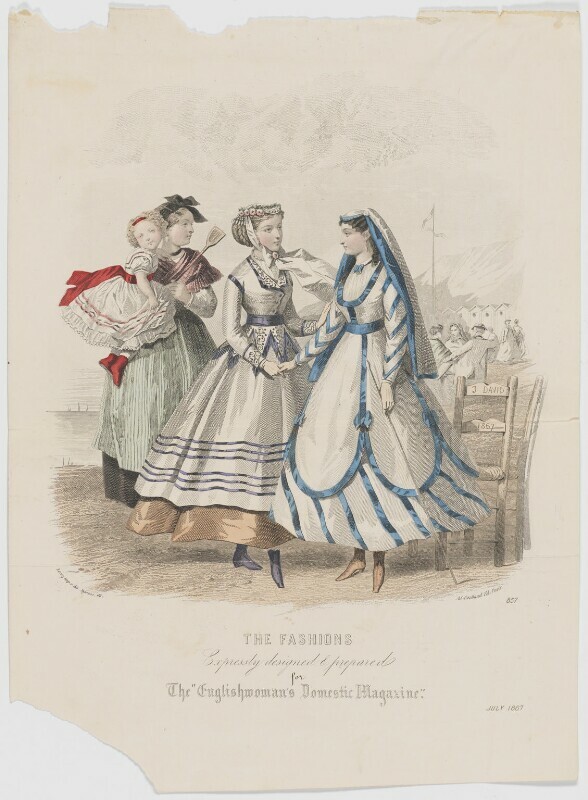 The Englishwoman's Domestic Magazine (1852-1879), Magazine. Artist associated with 40 portraits. Le Moniteur de la Mode (1843-1913), French magazine. Artist associated with 40 portraits. The Second Reform Act, although effectively a Liberal measure, is expediently passed by the Conservatives, under Disraeli's influence, who believed it would widen Conservative appeal by making the party appear more progressive. The Act extended the vote to 1.5 million working men in British towns, and redistributed 52 seats from towns with populations under 10,000 to the newer urban towns. Karl Marx publishes his hugely influential Das Kapital, whilst living and researching in London. Its proclaimed aim was 'to lay bare the economic law of motion of modern society', and it presented mid-Victorian capitalism in terms of a tragic drama. Henry Irving rises to fame on the London stage, performing alongside Ellen Terry for the first time, beginning their famous theatrical association. Francis Joseph, the Emperor of Austria, becomes King of Hungary, and thus ruler of the 'dual monarchy' of Austria-Hungary. The dominion of Canada is formed, as the British North America Act unites four British colonies, Nova Scotia, New Brunswick, Ontario and Quebec. The Act defines much of Canada's constitution and operation of government, and Canada's dominion status is the first of its kind.